Light-weight-aircraft, 2 seats (side by side), composite-construction (lumber, Styrofoam, glass - fiber and epoxy). Low-wing monoplane with quick removable Wings and retractable nose-wheel-landing-gear. The Flap movement is transferred to the aileron in a reduced rate. Stabilator with anti-servo-flap. Nose-wheel-steering and a shock-absorber (rubber) for the nose-landing-gear. Main-landing-gear made of strands on a lumber-core, hydraulic-brakes simultaneously applied by lever. Full-sight canopy slides opens in fwd direction. Rudder is cable-controlled, stabilator- and aileron by push rods. FAR 23 which is also valid in Switzerland. Nevertheless the aircraft remains an “ Experimental ”. A Good aerodynamic was chosen to save Performance, along with economy and low noise emission. Dimensions were kept compact rather than increasing wing aspect ratio for even better aerodynamics. The construction was based on own manufacturing-facilities (welding and painting outside). Permanent hangar-space is not necessary for the aircraft. For transportation both stabilizer-halves are removable and can be stowed in the Cockpit. 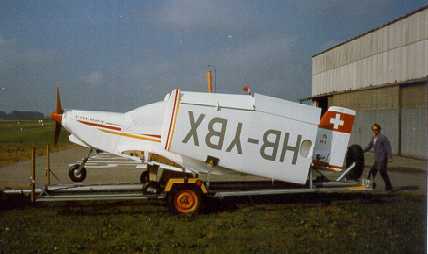 (30 Kg) can be removed and fixed on the trailer beside the fuselage. Disassembling and loading take approximately 15 minutes. Same applies for unloading and assembling were all necessary connections are made automatically. The weight of the loaded trailer is about 600 kg. In order to save limited space with fuselage and wings, small parts and assembly - units should be manufactured at first. The aircraft is not built in a primitive manner and requires anywhere from good up to advanced craftsmanship. The project requires about 4000 hours. Even if the prototype swallowed just 10 000 SFr till it’s 1st flight (including engine and instruments) it is recommended to assign more. During the construction period, which takes a few years, you can easily do without traveling or other expensive activities and thus save quiet the amount of money needed for this project. But the most important preconditions are spirit of enterprise, self-confidence and good friends.